What is 4 Booster Sealed? Four booster sealed is swiss pairing, 3 round, 8 player tournament on Magic Online. Each player opens up 4 booster packs and constructs a deck containing at least 30 cards. 4 booster sealed deck tournaments are run in the Sealed Swiss Queues room and they are on a rotating schedule for Thursday Night Magic which is found in the premiere events room. What cards sets can you play with 4 booster sealed? 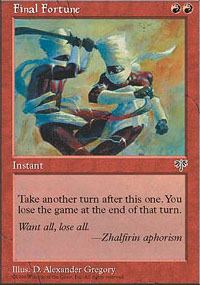 At the moment this format is only available for Magic 2011. However I'm sure this will be expanded to other standard legal sets in the future. The entry fee is 4 booster packs from the appropriate set and zero event tickets. That means it is just about $2.00 more expensive than your typical Swiss Draft. The prizes for Thursday Night Magic are identical with the additional of the Thursday Night Magic promo card awarded to each player that participates in those events. How do the prizes compare to other Magic Online formats? As you can see the prizes for 4-booster swiss are better than every other SWISS sealed deck and draft format at all skill levels except for the top players at the new set release events. Expected value calculations with a fixed win percentage are very unrealistic, however they are easy to understand and they work reasonably well for this comparison. The point is that WotC gave us some really great prize distributions for 4-booster swiss. What are the deckbuilding restrictions? You must construct a deck with at least 30 cards in it. You can have more than that, however it is almost always to your advantage to stick to a 30 card deck. How many lands should I include in my deck? 12-13 lands in a 30 card deck pretty much corresponds to 16-17 lands in a 40 card deck, therefore that is the most typical advise. I generally run 14 lands unless I have a couple of low casting cost spells that can help me find land such as Sylvan Ranger, Augury Owl and Preordain. How should I divide my lands for a 2 color or 3 color deck? For two color decks, my goal is to have at least 6 sources of mana of each color. 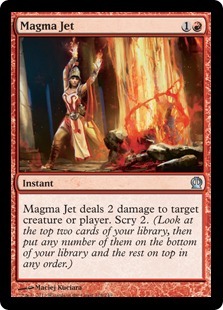 If my spells have a large color commitment such as Chandra's Outrage, Serra Angel, and Corrupt, then I would want more mana sources of those colors. If I'm just splashing a color, I want at least 3 sources of that color. This has worked out pretty well for me. I say sources rather than lands because cards like Cultivate and Sylvan Ranger can be sources of a different color of mana as well as cards that scry. However I don't count scry as a full source and I really want at least 2-3 scry cards before I consider it a reliable color fixing source. Not all 4-color sealed pools in M2011 can support 3 colors. I generally wouldn't try 3 colors unless you have at least 2 color fixers such asTerramorphic Expanse, Sylvan Ranger, and Cultivate or 3 scry cards such as Crystal Ball, Foresee, or Preordain. Also your fixers and scry cards should be in you main color. If you don't have one of these things 3 color decks will be inconsistent at best. Is library destruction/milling now a broken strategy? With everyone playing a 30 card deck, milling cards like Tome Scour and Jace's Erasure are certainly "better". However just because they are "better" doesn't mean that a good milling deck is easy to make or completely broken in the format. Look at it this way, if your starting life total was 14 instead of 20, weenie rush decks would be much better. However bad weenies like Merfolk Spy would probably still be unplayable. I have yet to see a milling strategy work in 4 booster sealed, and I've played in several 4-booster sealed tournaments. What other factors should I consider when constructing a 30 card deck? Since you have fewer cards in your deck, each card in your deck shows up more often. This means that bombs become more important, and combo cards become more important. I generally lean more towards playing my bombs over playing a deeper color in 4-booster sealed over 6-booster sealed. I also lean more heavily on playing cards that work better in a combo than alone such as Bloodthrone Vampire and Act of Treason. Why should I play this format? 4 Booster Sealed deck is a good format if you want to keep playing and playing without winning or losing a lot. Unlike Swiss drafts, you always have the possibility to make a profit in any given tournament and the entry fee isn't that much more than a Swiss draft. I believe this is the perfect format for players that have a limited budget and don't want to play in constructed tournaments for whatever reason. Why should I avoid this format? This format has a very flat payout, so don't expect to get rich playing it. It's definitely a low risk, low reward type of situation. Also, 4-booster swiss tournaments play out very similarly to 6-booster tournaments. Luck is a significant factor in this format. It's not like the Momir Vig type of luck, but still if you find yourself complaining about how lucky your opponents are, you probably aren't going to like this format. Here is the tournament report from the 1st 4-booster event that I entered. Now take a look at my cards and see if you can guess what I built. How would you build this deck? Artifacts: Whispersilk Cloak is a true bomb that wins lots of games. Platinum Angel is a semi-bomb in the fact that it will win games all on its own if your opponent doesn't stop it, but it also costs 7 mana. M2011 games often don't last long enough for either player to cast 7cc creatures. Also this particular pool of cards has 3 7cc "I win" cards. Still, Platinum Angel and Whispersilk Cloak will most likely make the cut. Black: Black is fairly deep and it also has the (Reassembling Skeletons)/Bloodthrone Vampire combo. This combo is just a bit better in 4 booster swiss because of the smaller deck size. It's likelihood of coming up is just a bit greater. Black also has (Doomblade), Assassinate, and Deathmark which makes it a very solid color. Green: Green has 3 very nice big creatures, but it has no depth, and will therefore probably not be played. Red: Red is also not very deep, but it has some two semi-bombs in Pyroclasm and Ancient Hellkite. Also Act of Treason is really really good in a format like M2011 because most matches come down to racing, there are lots of very huge, very powerful expensive creatures to steal, and Fling and Bloodthrone Vampire exist. Red is a distinct possibility. Blue: Is short of flyers and card drawing cards, which leaves.... nothing. White: Has a semi-bomb finisher, Blinding Mage, Roc Egg to go with Bloodthrone Vampire and a number of early game threats. White is certainly playable with this pool, but it is also somewhat unspectacular. Here's the screen-shot of my final decklist. And here's the formatted version of my deck. Now, on to the matches. My opening hand is a bit light on mana, but otherwise it's looking pretty good in the fact that I have both pieces of the Skeleton/Vampire combo. Quiz 1: Here is a question, which do you play out first Reassembling Skeleton or Bloodthrone Vampire? If we play out the Bloodthrone Vampire first, we can play the Skeleton on turn 3 and sacrifice it to the Vampire for an extra 2 damage. While this is the more aggressive play, it misses the fact that we probably aren't going to want to spend mana during our early turns recurring the Skeleton to pump the Vampire when we have a hand full of other cards to play. Ideally we want to keep both the Vampire and Skeleton out on turn 3 and not use the sacrifice unless it is necessary. Playing out the Skeleton first is a more defensive play, it protects our Bloodthrone Vampire from removal spells such as pyroclasm and Stabbing Pain and we aren't likely to be aggressive enough to want to sacrifice our recursive skeleton just for an extra 2 damage. I end up playing out the Skeleton and then the Vampire. I draw a few more land and a Manic Vandal for my opponent's Gargoyle Sentinel. My opponent is noticeably short on early plays and never has any removal for Bloodthrone Vampire. I'm short on mana, thanks to my opponent's Acidic Slime. Even though I end up with no possibility of playing my two big spells, I'm able to rush through my opponent's defenses with the help of a couple of removal spells. I sideboard in Deathmark for Nightwing Shade. I originally thought that Nightwing Shade was an average playable card, but I'm beginning to think that it is almost unplayable because of how fast the format is. It's just too slow to make a difference, it can't block very well the turn it comes out, and requires too much mana to overcome other common flyers. Quiz 2: After an obvious mulligan 1 land hand I receive this hand. It's obviously weak, but I'm already down a card. Should I keep it? From game 1, it looks like my opponent has a slow red/green deck and I have a reasonable chance of using Assassinate on turn 3. I don't want to go down to 5 cards, especially with a deck that contains two 7cc creatures, so I reluctantly keep this hand. So I keep the hand and proceed to draw a Child of Night and my Vampire/Skeleton combo. My opponent doesn't have a very aggressive draw starting off with a turn 3 (Gargoyle Sentinnel). I trade a Child of Night for my opponent's attacking Vulshok Berserker. Then I get out a berserker of my own and use the Whispersilk Cloak to bypass my opponent's Gargoyle wall. Quiz 3: Shown above is the game state at the beginning of my 6th turn. What is the play? I can play out the skeletons and sacrifice them to the Bloodthrone Vampire twice to hit my opponent for 8 damage and threaten a win the next turn. But that gives my opponent the chance to race me pretty evenly. With a cloak out, I'm not to worried about getting damage through to my opponent, so I would prefer to play this defensively. I play out the skeleton, attack for 4, and play the Assassinate on the gargoyle. The Skeleton effectively shuts down troll damage and with the Cloak allows me to get lethal damage through in the next 2 turns. My opponent plays out a Temple Bell uses it and then plays out Garruk's Companion. I draw a Deathmark. My opponent then attacks with his troll and I throw my skeleton underneath that bus. During my next turn I draw a Swamp and play it. Then I kill Garruk's Companion with my Deathmark and attack for 6 with one sacrificed Skeleton. This puts my opponent at 4 life and I'm able to finish him off during the next turn as shown above. Before conceding my opponent starts to complain as shown above. Now this brings up an etiquette question. Quiz 4: What do you do when your opponent complains about luck? Since this really isn't a question that has a clear-cut answer, feel free to debate it in the comments. Personally I don't respond to in-game complaints as I don't want to make people more upset than they already are about losing due to poor luck or perceived poor luck. From the screen capture above, it seems like my opponent in this case assumed my silence was an insult. You just never know how people are going to respond online. My opponent starts off with a turn 2 bomb in Fauna Shaman. I try to match it with a turn 2 Black Knight. Then my opponent casts a turn 3 Liliana's Specter which leads to my next quiz. Knowing which card to discard to a Specter or Mind Rot is often not very trivial and vitally important. It is also often dependent on making educated guesses on what land you are likely to draw in the next couple of turns. Quiz 5: Which card do you discard to Liliana's Specter? The choice comes down to Nightwing Shade or Ancient Hellkite. Both of these cards are currently unplayable and will most likely not be relevant for several turns. Nightwing Shade will come out a couple of turns earlier, but will have a much lesser impact than the Hellkite. I didn't scout my opponent's deck so I didn't know if he was playing Rise from the Grave. If I knew for sure that he had a Rise from the Grave I would discard the Shade. If I had watched his first round and didn't see a Rise from the Grave I would probably drop the Hellkite. Without knowing this critical piece of information, I decided to discard the Shade. With hindsight I believe this to be a mistake and I think discarding the Hellkite is the way to go here. So on my next turn I draw into a Pyroclasm. I now have a way to clear the board, and I have the Bloodthrone Vampire and Act of Treason which means I'm not that worried about what my opponent can pick find with Fauna Shaman. So I attack with the Black Knight and play out Bloodthrone Vampire with the hopes of getting more card advantage from Pyroclasm and hopefully being able to steal my opponent's search target with Act of Treason. What I didn't anticipate is that my opponent would search out a Grave Titan. Suddenly Pyroclasming a turn earlier looks a whole lot better. Fortunately, I still have the Act of Treason play. My opponent also plays Sign in Blood and passes the turn back to me. I decide to sacrifice the Knight, play pyroclasm and sweep the board. My opponent uses Nature's Spiral to regrow Liliana's Specter and replays it. I'm left with few options except to wait for Titan, steal it, sack it, and swing for the fences. With not much else to do I decide to play out a Child of Night over a Whispersilk Cloak and I pass the turn back to my opponent. As planned my opponent plays out the Grave Titan. Of course I'm going to steal it, but what else should I do? Quiz 6: Given the game above, what is the play? The question is not about using Act of Treason the question is what do we attack with. Attacking with just the Grave Titan will leave us with either 6 more damage or up 2 zombie tokens to 1 zombie token. If we attack with Child of Night we will simply trade with a Zombie Token. If we attack with Bloodthrone Vampire we can trade a zombie token for one of our opponent's zombie tokens or we can squeeze another point of damage in. Since we already have (Chandra's Rage) I believe we should be as aggressive as possible and attack with everything. That is what I do and my opponent blocks the Child of Night and Bloodthrone Vampire and doesn't block the Titan. I sacrifice a token to pump up my Vampire, let damage resolve and sacrifice the Titan so I don't have to give it back. My opponent then makes it that much easier for me by playing a Howling Banshee. I use Chandra's Outrage on the Banshee and attack with everything for the win. I once again sideboard in Deathmark and Side out Nightwing Shade. This is not the best hand in the world, but Pyroclasm means that I'm not too worried about being blown out by an aggressive draw like my opponent had in game 1. I decided to keep the hand. The next game starts out reasonably slowly. I have a lot of removal, but not much in terms of pressure. This is not necessarily a good thing when facing an opponent with both Fauna Shaman and Grave Titan. To top it off, my opponent is able to accelerate his mana with Cultivate. The good news is that I have Whispersilk Cloak to force damage through each turn. My opponent's first creature is a Greater Basilisk which is a great target for Deathmark. My opponent plays out Sign in Blood and plays out a Bloodthrone Vampire followed by a Spined Wurm the following turn. Meanwhile I'm way ahead on the race thanks to my cloaked Knight and his own Sign in Blood. Next I play out a Rotting Legion so that I can shorten my opponent's clock by a turn or two. Next my opponent brings out another one of his bombs, Overwhelming Stampede, and suddenly he's racing me pretty well. Then to add insult to injury he hits my Rotting Legion with Quag Sickness. At least I still have Assassinate for his Spined Wurm. Well I end up topdecking (Doomblade), which means I can knock out his Bloodthrone Vampire with the Assassinate and his Spined Wurm with (Doomblade) leaving him creatureless against my cloaked Black Knight and quag sickened Rotting Legion. At 3 life, I can't afford to leave the Bloodthrone Vampire alive. Well my opponent plays out Grave Titan and I'm fighting for my life again. I manage to topdeck a Reassembling Skeleton so I can survive another turn and still attack with my Black Knight but I'm getting to the point where only one card will save me. With another stroke of luck I topdeck the one card that can save me. I play out Act of Treason and steal my opponent's Grave Titan, equip him with the Whispersilk Cloak and swing into victory. Afterward my opponent informs me that Act of Treason is not a good card. This is one of the worst 2-land hands you can get, and therefore I take a mulligan into the following hand. My opponent this round is blue and white and his deck seems very solid with all of the usual blue/white skies commons. I've got a slow start and I debate using up my removal on his early creatures to buy me some time. I decide that I can afford 2 damage to see if I can use my Doom Blade on something better than a Bear. My opponent has no three-drop and passes the turn back to me. Then I topdeck a land and decide that I will trade an Assassinate for a (Bear) so I can save my (Doomblade) for something bigger. On his next turn my opponent plays a Terramorphic Expanse and passes the turn back to me. I draw into another land and play out a Canyon Minotaur. My opponent matches it with an Azure Drake on his next turn. It's back to my turn and at this point I feel I can start to act aggressively. I Doom Blade the drake, swing with my Minotaur and pass the turn back. My opponent shows me another Azure Drake. I can only summon a Child of Night on my next turn. My opponent then summons an Assault Griffin. 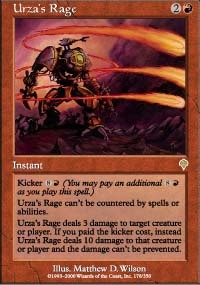 Back to my turn, and I drew a Chandra's Outrage, which is just what I need to start attacking again. The Azure Drake goes down in flames and I attack with everything. My opponent trades his griffin for my minotaur. At this point I stop drawing land. I trade a few more creatures with my opponent and then he gets out a Sun Titan which pretty much crushes me as I can't get anywhere near the mana I need for my Dragon or Angel to hit the field. Once again I sideboard in Deathmark for Nightwing Shade and go on to game 2. This is an extremely weak hand, and really should be mulliganed. I should have mulliganed it, but I didn't. My mind was thinking about the two 7cc creatures that were stuck in my hand last game and started thinking that this hand looked good enough to keep. I draw a Deathmark and my opponent punishes my poor mulligan choices by playing out a Scroll Thief. The Thief hits me and draws a card, then my opponent plays out a Wall of Frost. I manage to topdeck an Act of Treason to take my opponent's Scroll Thief to bounce into a wall while my Bloodthrone Vampire hits for 3 damage and dumps the Scroll Thief in a dark alley somewhere. Here's where I should have lost the game. My opponent puts down a Water Servant and is out-racing my Bloodthrone Vampire by leaps and bounds. Then he decides to play a (Day of Judgement) when it's obviously in my favor. Why my opponent does this is beyond me. Anyway, it allows me to topdeck my Ancient Hellkite the next turn and use it without fear of a (Day of Judgement). My opponent decides to concede shortly after this. This hand looks good to me and I keep it. This game comes down to a fairly straight-forward race. I start out faster with a Child of Night, Black Knight, and Whispersilk Cloak but my opponent comes back with more creatures and a Condemn. I'm able to Deathmark his Assault Griffin which he needed to finish me off a turn before I can finish him off with a cloaked Rotting Legion. So, that's the end of my tournament report. I felt that Act of Treason is definitely much better than people think. Especially in M2011 which often comes down to racing and most games play out with very few creature stalls. I have one more question to put to the readers. If you noticed, I drew first in just about every game I played. This is because I chose to draw first and my opponents always chose to play first. In this format my thought is that drawing first is the right move in most circumstances. This format may be fast, but I've rarely seen players win with a horde of two-drops. Playing first makes you more likely to miss your 4th land drop and in this format, I find that to be critical. I also believe that sealed deck formats including this one are more likely to focus on slightly higher curves, but I could be wrong. So what do you think? 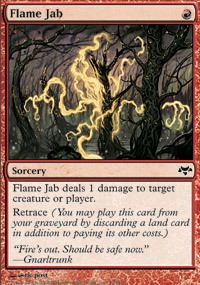 Is it better to draw first or play first in the 4-Booster M2011 sealed deck format? Thanks for reading, and see you in the 4-Booster Sealed Deck queues. Marcus, "Shuyin Knight of Zanarkand" on Magic Online. Good job in the event, seems like you managed it well enough. As far as complaints about luck go I'm in the position of a person who has done it a lot, may continue to but knows that it's really stupid to do so. I advise anyone with more self control than me to avoid doing it, and if you dont have that self control try to get it. How to respond to people who complain? Well the best way is not to join them in their lack of manners and self respect and simply be polite and move on. I really like the question and answer format of this article. Had me reading more actively than a typical tournament report, which helped hold my attention. I've done a few of these 4-pack sealed deck tournaments over the past couple of days and I'm 10-2 so far (two 3-0s, two 2-1s). I haven't opened many bombs, so my plan is to play as many counters as I can along with card draw and cheap flyers (incidentally, this is very similar to my draft strategy). This allows me to beat up on decks built in shallow colors with one or two bombs. Nice Goblin Pikers! I'll Cancel your Inferno Titan. Just so they don't get frustrated with my lack of response and bail without conceding. Plus, we've all been there. I can relate. Awesome play and great report. Those little mistakes we all wonder about why we make them. I usually make a lot more. If people complain that's their problem, really. They're responsible for their behaviour. Magic is often like football, it is a game of inches. Sometimes something as simple as playing the wrong land on the first turn can cost you the game. On the subject of complainers: Everyone complains. Maybe not about magic but everyone complains about something, and everyone complains differently. If my opponent is a jerk about his loss, I ignore him and move on. If someone frowns after missing their second land drop I might say something to the effect of, "hate it when that happens :-(" It depends on the scenario and tone. Mana flood/screw is something just about anyone can relate to, and I can relate with that. I'm pretty talkative anyway, and usually will discuss the format and game afterwards if the other players are talkative. Usually in those convo's someone vents about something, and I really try not to be rude. Hey, I'm a human too. I think your opponent is right about act of treason, in the sense that its not exactly "good." In context though he isn't entirely right. The card certaintly isn't bad which seems to be what he's implying, and with the right support it is easily worth running. You have the vampire, and that made act of treason a perfectly fine option as a 23rd card(well, 17th). If you pull it withou a sac outlet it helps you push through attacks, but with the vampire its an amazing removal spell. In black/red drafts/sealed pools its value goes up. Although I certaintly wouldn't want to play it without synergy for it in the deck. Thank you all for the comments. I really appreciate them. The issue I have with responding to complainers is that I often feel sympathy for the poor luck they've had and I'll even go so far as to acknowledge when I was lucky, but most of the time you're not going to have that much of a meaningful conversation with someone who is complaining. BradWoj, I like your response to that type of situation. It's simple and is unlikely to cause your opponent to start lashing out at you. Act of Treason is much better in M2011 than M2010. There are many fewer walls and defensive creatures in M2011, which means it's much more unlikely that creature stalls happen. This means that racing your opponent becomes much more important. Now I wouldn't say that Act of Treason is one of the best commons in the format, but it is certainly better than a lot of filler cards and average creatures. I agree with Windcoarse, that everyone complains. Also, I don't think you should take complaining as necessarily a negative thing, I mean, I'm a very talkative player as well, and sometimes I want to talk about what went wrong or formats in general. We're geeks and like to talk about the good times and bad. I signed up here at PureMTGO just to reply to this because I feel so strongly that being mute/silent is, indeed, insulting. Ok, let's say he's flat out complaining and throwing a pity party. You could at least say, "Yeah" or even "yeah, sealed formats are full of luck of the cracked pack". Something. Anything. If someone came up to you in real life and asked you for the time and said how his watch was stolen and he can't afford another, blah blah blah, are you going to just ignore him . . . a cold, hard snub? MTGO is a pretty cold place as it is, and I enjoy reaching out and making it more human, be it by commenting on what's going on in the game, wishing a player good luck (even if they're mute) and saying "good game" or "thanks for the games". Staying silent when someone is not being an outright jerk just adds to the coldness of MTGO, and to me, that equals adding to the problem, not solving it. I generally don't talk very much during the game because I like to focus on the game. I like chatting after a match or between rounds, I just don't really like chatting in game. I realize that there are people who don't share this view and I like hearing from them. I agree that Magic Online is a pretty cold place, and it's difficult to make friends here. A lot of that is because of the chat interface which WotC is going to improve. In my opinion it's difficult if not impossible to try to improve the community through chat during matches. During a match, tensions are running high, as well as frustration and anger. So it's very easy to hear your opponent's friendly consilatory words as condescending banter. I don't mind small chat during a match, but for the most part I don't consider it very meaningful. Community on Magic online needs to be formed outside of matches. It's much easier to form a community on Magic Online websites, message boards, chat rooms, and clans than it is during matches. This, however, is just my opinion and I accept and acknowledge counterpoints like the one you've shared with us. Old article, but I'll comment anyway. Thanks for writing such an extended run down of 30 card sealed swiss. I am playing one right now for the first time in ages (SoM is boring and got enough of MED4 for now) and really needed a quick confirmation about the land count and stuff like that. I am very lucky as I opened 2 mythics including a green titan on my first try. I like to chat during or after the play. I often start conversations, when I lost or won big. When I lost and feel like the opponent was a nice guy from a few remarks in game I often try to talk with him, somehow it makes me feel better about my loss. I hat arrogant winners. If I win I like to talk as well, maybe rerun some plays, to try to find out if I made errors, or got lucky or anything.. sometimes it helps to improve my game. Once in a while I use the addbuddy after such chats, but the problem is, a few months later you never know which nickname is which person and those 'buddies' remain random strangers, so it's kinda useless.